The Diaper Bank distributes 60,000 in one day! 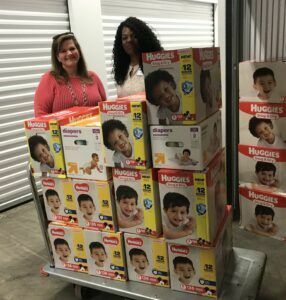 Thanks to a partnership with the National Diaper Bank Network and Huggies, we were able to purchase and distribute 60,000 in one day! This was quite an accomplishment considering in the year 2015 we gave out a total of 58,000 diapers. This national partnership allows us to purchase diapers at a discounted price. This is especially helpful as we can purchase the diaper sizes most in demand, (4,5 and 6’s) which are the most expensive at stores. 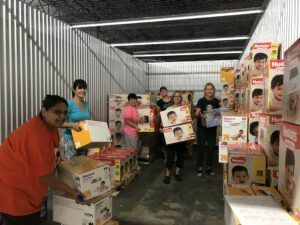 A special thank you to Acorn Mini Storage for donating storage space, the many volunteers who helped with the distribution and our wonderful partners for getting the diapers out to little ones in need. Your financial support goes a long way. 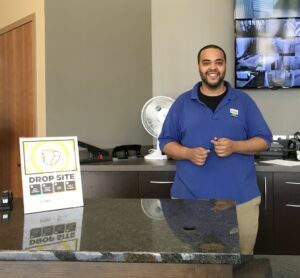 You can donate on our website http://www.diaperbankmn.org or mail a check to Diaper Bank Minnesota, 709 University Ave West, St, Paul, Mn 55104. Fantastic Staff of Acorn Mini Storage. Prince of Peace and Hope4Youth are two of our partners who received diapers. Minnesota Gopher Football Diaper Drive – 18,000 diapers! Thank you to the Mother Baby Center at United Hospital! Enormous Thank You to Pottery Barn Kids in Edina! Diaper donations are always welcome without an appointment.